Amatrol’s Safety I/O with Reversing Starter Learning System – Siemens ET200 (89-ET200RM) teaches reversing motor starter configuration, programming, and operation in Safety PLC applications. Specifically, this learning system focuses on using a Siemens ET200pro Safety PLC with Step 7 software to teach applicable reversing motor applications such as controlling the movement of a conveyor system that does not require a variable speed. Major topic areas within the 89-ET200RM curriculum are reversing motor starter operation, ET200pro motor starter construction, ASM 400V disconnect module operation, starter configuration, and starter programming. 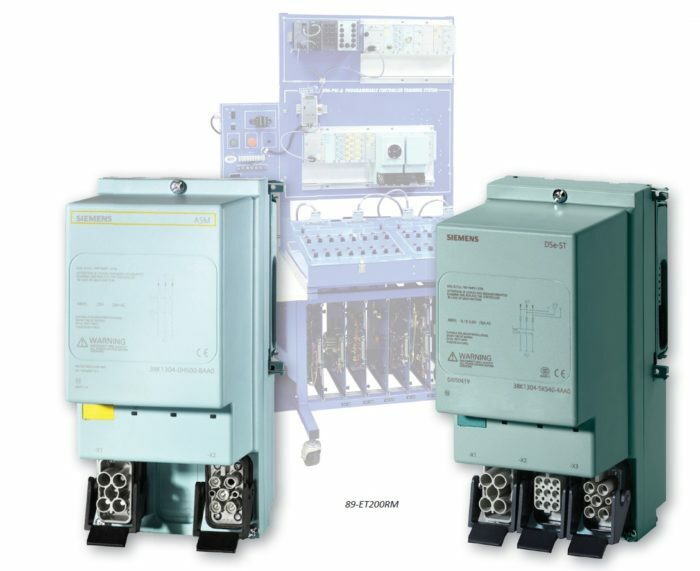 The 89-ET200RM includes a Siemens ET200pro reversing motor starter, discrete I/O modules, ET200 disconnect module, curriculum, instructor’s guide, and installation guide. This learning system adds to the Programmable Controller Troubleshooting Learning System (890-PECB) and the Siemens ET200PRO-Safety PLC Troubleshooting Learning System (890-ET200SF) to expand Amatrol’s offering of Safety PLC curriculum. The 89-ET200RM’s curriculum covers the configuration, programming, and operation of reversing motor starters used within Safety PLC applications. Learners will practice with real-world components such as Siemens ET200pro reversing motor starter, ET200pro panel, 8-pt discrete input module high feature, 4/8-in 4-out failsafe discrete I/O module, 2-in 3-out failsafe discrete I/O module, ET200 disconnect module, I/O connector kit, e-stop assembly, and motor power cable. As an example of how these components will be used, learners will study the construction of ET200pro motor starter, the operation of an ASM 400V disconnect module, and how to confi gure an ASM and reversing motor starter in a Step 7 project. In addition to the Reversing Motor Starter learning system, the 890-ET200SF features an array of safety PLC learning options. Additional learning systems include: ET200S Stack Light Learning System (89-SLET200), ET-200PRO PROFINET Pneumatic Learning System (89-EPN1), ET200 RFID Learning System (89-RFET200), ET200 MPC Learning System (89-PNET200), and ET200PRO PROFINET HMI Learning System (89-HMIET200).